Scale Spain’s highest peak, then explore lively Puerto de la Cruz on this full-day tour of Tenerife. Marvel at the UNESCO-listed wonders of Teide National park, take in the views from Mt. Teide and pose for photos by the Roques de Garcia. After lunch (not included), head north to explore the lively coastal resort of Puerto de la Cruz. 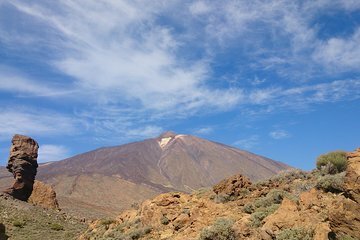 Meet your guide at your hotel in South Tenerife and set out to explore the lava-sculpted landscapes of the UNESCO-listed Teide National Park. Keep your camera close to hand as you wind through the pine forests and rural villages, and stop en-route to explore Vilaflor, the highest village in Spain at 4,593 feet (1,400 meters). Continue through the startling volcanic landscapes, passing natural landmarks like the Roques de Garcia, the looming peaks of Mt. Teide and Pico Viejo and the lava fields of Las Cañadas del Teide. Next, tour the lively coastal resort of Puerto de la Cruz and take in highlights like Plaza del Charco, the beautiful Martiánez Lake, the Botanical Gardens and the striking black sand beach of Playa Jardin. After free time to take in the sights and browse the shops independently, end your tour with a return transfer to your hotel.